Count to 10 - Beans! Beans! Counting for Kindergarteners! Count to 10 – Beans! Beans! You’ll need some beans for this count to 10 worksheet. Kids count out and glue the number of beans to match the number in each box. Have fun! 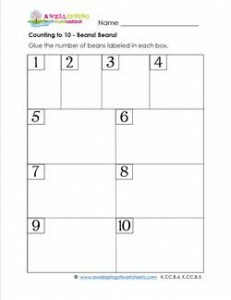 Please go to this page to see all the count to 10 with a dash of fun worksheets in this set. Subjects: Kindergarten Counting Worksheets // Math // Counting // Count to 10 - with a Dash of Fun!